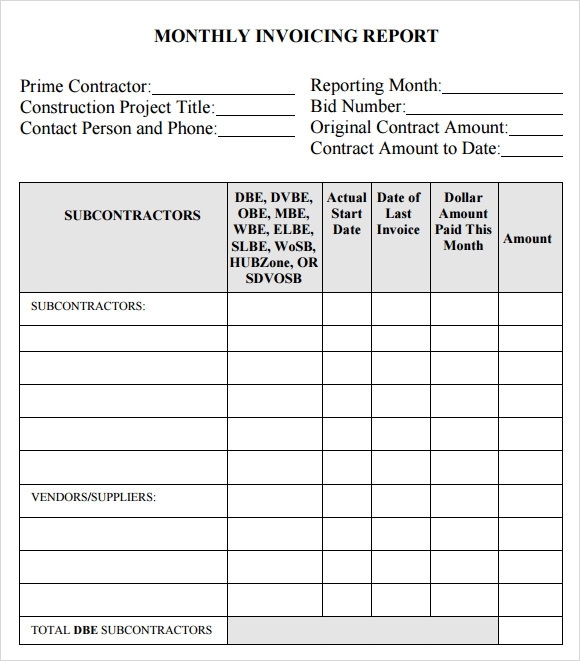 Keeping track of payments made to construction workers is an important thing to do, usually for proper recording keeping. 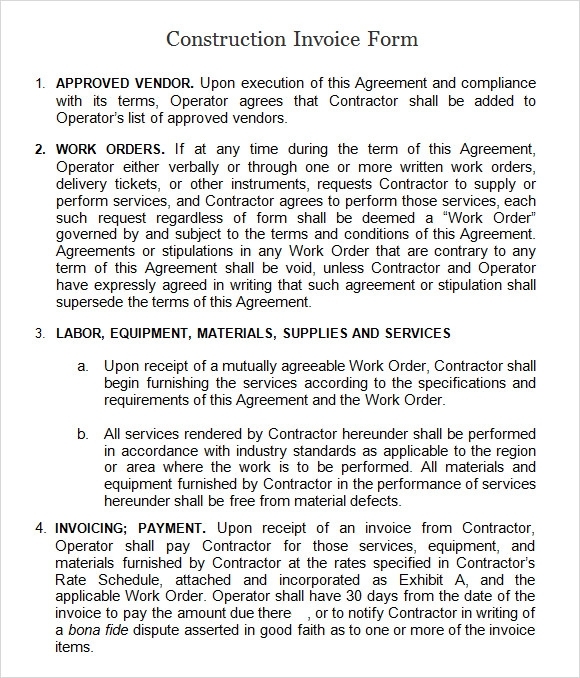 Usually, this kind of an invoice has its own kind of an outline, which means the construction manager has to hire someone to create and manage the invoice. 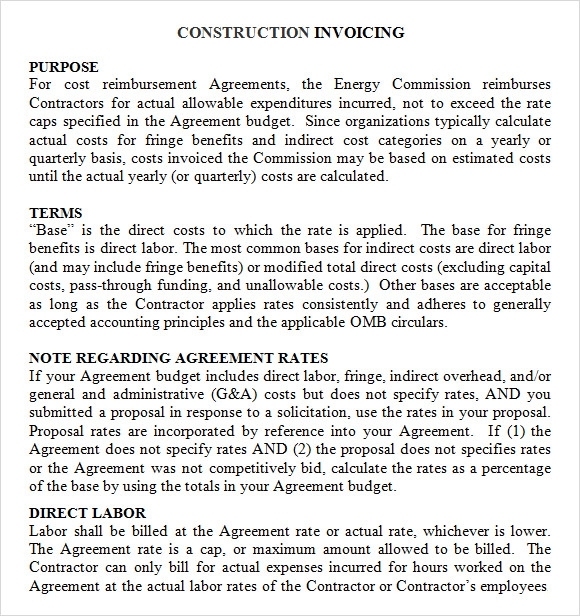 The best thing is that you can download and use construction invoice template so that the only work toy have remaining is dealing with the management of the invoice. 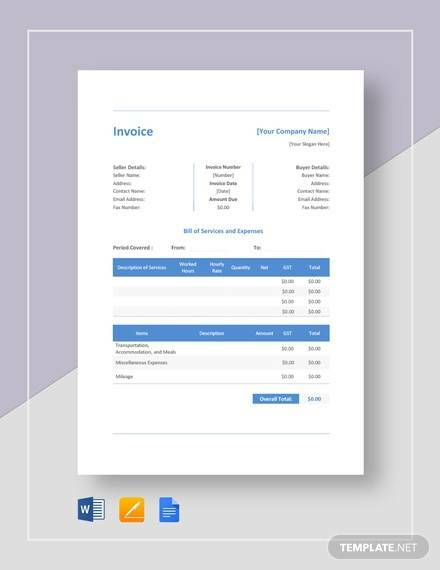 Created to help make work easier ,download Freelance Invoice Templates you will certainly find the printable invoice template useful and reusable in whatever construction project your business undertakes from time to time. 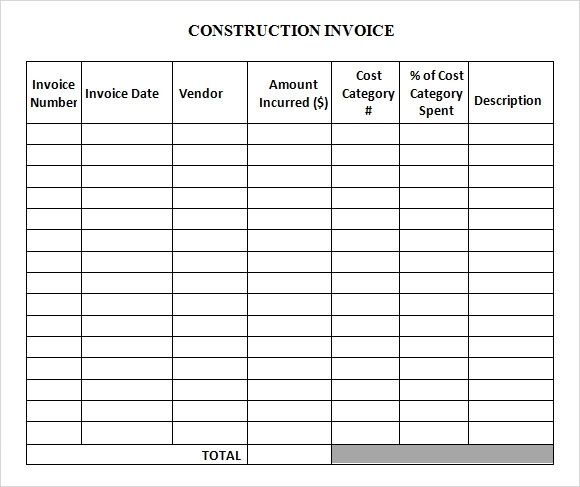 This sample of construction billing invoice template is a detailed payment invoice used by vendors. On the top most portion of the template, the name of the contractor, his project name, his duration of work and dates are mentioned. The second part contains a detailed explanation of various charges and fees for the consultant as well as for the architect. The third section contains a table which is divided into 5 sections. The sections goes as description of work, schedule of values, previous billed work, materials presently stored for billing and completed work which are yet to be billed. 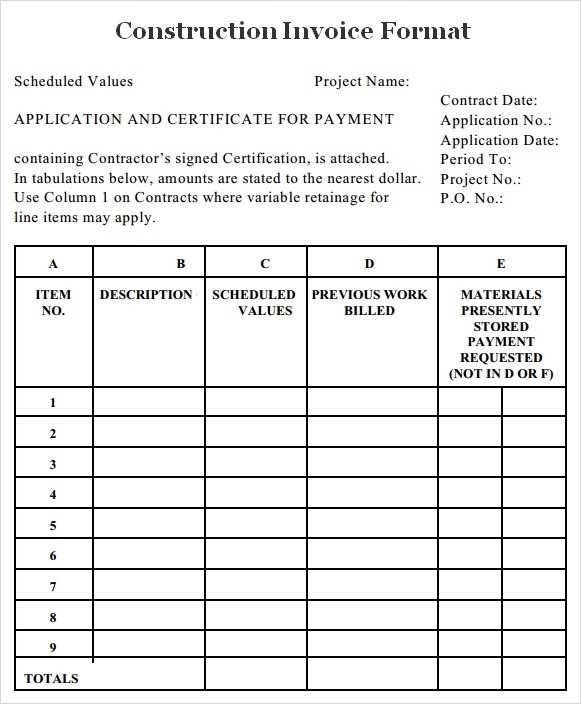 This sample of construction invoice template has a simple design. In this template the name of the project and project code is written, which is followed by a table where the account type, vendor’s name , invoice amount and description is written down. The total amount requested in written down in another column. 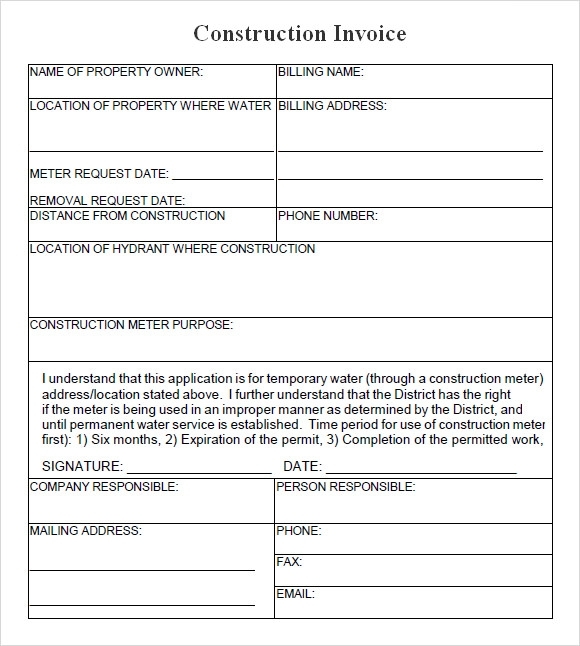 This sample of construction invoice template is meant for the application of a temporary meter. The opening section of the template contains name of the proprietor, his current billing address, location of the property and reasons for removing the meter. This sample has a disclosure which should be read carefully by the client before putting his signature and dates. The end section contains a narrow strip of pinkish paper which is meant for official purposes. 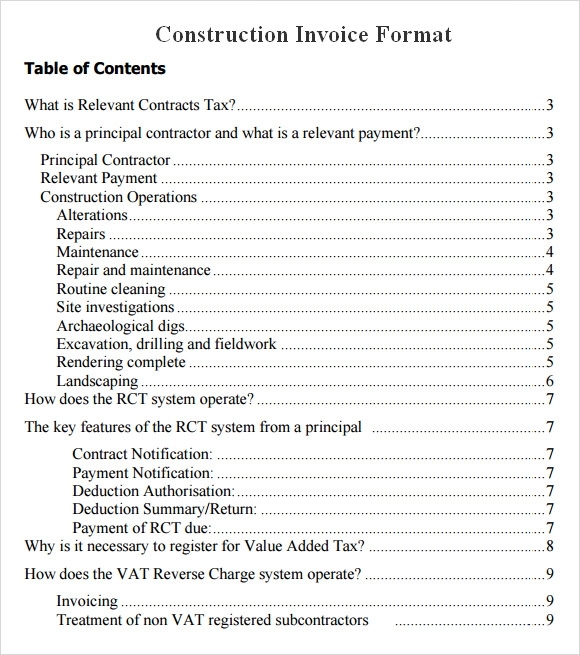 This sample of contractor invoice form is describes the purpose of the report in the opening paragraph. It then goes on to describe the project report summary, impact analysis and participant responsibility with the help of neatly drawn out tables and financial attachments for better understanding of the situation. An invoice is known as a document where the seller specifies the cost of products, goods or services which has been sent or used by the buyer. A buyer is expected to pay the invoice within a stipulated period of time. Information included in the invoice includes the contact information of both the parties, details about the mode of payment and cost per unit of product. What Is The Importance Of An Invoice? Invoices are quite important given the fact that they are used as a mode of payment. If you have an online business, Invoice Templates play a big role in ensuring that the transaction is completed with the simple click of a button. Invoices are considered legal document and in the event that a customer does not pay, the company can drag him down to the court of law and force him to pay. How to Write A Professional Invoice? If you are planning to write a professional invoice, the first thing which you should do is to treat your invoice as a business latter and begin with the name of your company right at the top followed by your contact information. The second part consists of adding the name and contact information of the recipient. Add the invoice number and customer account number in the third step. List down the services or product for which the invoice is being created and add all relevant taxes and fees and generate a subtotal. Once that is done, you should add a due date and payment option and send it either online or through registered post. An invoice is an important piece of financial document, which is crucial for the accounts and finance department of the company. You can download an invoice from our wide range of samples or use them as a reference guide for generating your own invoice.